Updated at 5:05 p.m. with comments from Governor Lamont’s senior advisor. 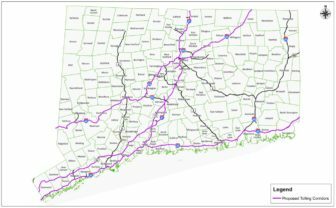 Connecticut pumps nearly $1.6 billion in new state and federal money into its transportation capital program each year. 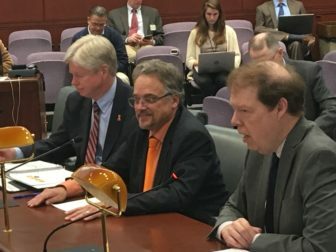 The problem, Department of Transportation officials testified Monday, is that to make all repairs and the strategic enhancements needed to transform the aging, overcrowded system, Connecticut needs to find 30 percent more. DOT officials also told a key legislative panel that Connecticut is barely treading water with its current capital program. In other words, the average condition of roads, bridges and rail lines is being maintained roughly the same. But the state is relying on a system of short-term “patches” that will become increasingly problematic over the next decade. If Connecticut still is patching bridges and other structures it should be replacing 10 years from now, the overall condition of the transportation network will be significantly worse, transportation officials said. “At our current levels of funding, we’re more or less standing still,” Mark Rolfe, chief of the DOT’s Bureau of Construction and Engineering, told the Transportation Bonding Subcommittee of the Finance, Revenue and Bonding Committee. And until Gov. Ned Lamont and the General Assembly decide upon a long-term revenue plan for the transportation system, “we will continue (with) just a state of good repair. We won’t be advancing” added DOT Commissioner Joseph Giulietti. For the past several years legislators have been listening to analysts warning that the Special Transportation Fund — which represents $1.6 billion or just under 8 percent of the overall state budget — is in dire fiscal straits. Though the fund, on paper, is projected to run surpluses, transportation officials say that’s only because Connecticut — for too many years — is spending far too little to maintain and upgrade its infrastructure. Though the Special Transportation Fund pays for DOT operations and supports various public transit programs, its single-largest expense — about 40 percent of the entire fund — involves paying down principal and interest on borrowing to support the capital program. In other words, if Connecticut needs a more robust capital program, it also needs more resources in its Special Transportation Fund to cover the resulting debt. “We need to find a way to get through this,” Giulietti said. The Lamont administration estimates that should Connecticut ramp up the capital program, the transportation fund would be insolvent at some point in the coming decade. Connecticut currently issues about $800 million in transportation bonds per year. And Robert Card, chief of the DOT’s Bureau of Finance and Administration, said those bond proceeds help Connecticut qualify for roughly another $750 million in matching federal grants. That means about $1.55 billion in state and federal resources are being pumped into the capital program this fiscal year. But lawmakers on Monday asked Card how much the DOT would need not just to keep an aging transportation system in its current condition, but to make long-term repairs and strategic improvements like widening highways and rebuilding interstate junctions. The “dream” scenario, Card said, would be $2 billion. It remains unclear whether Congress and President Trump will be expanding federal transportation funding for states, or — if they do — how much a wealthy state like Connecticut would benefit. Lamont has proposed installing electronic tolls on major highways. The administration estimates this would raise as much as $800 million per year for the Special Transportation Fund — in turn enabling Connecticut to dramatically increase borrowing for the capital program. Republicans, who are in the minority in the House and Senate, have proposed an alternative plan that doesn’t require tolls. Equally important, Republican legislators say, Connecticut also wouldn’t need to to wait four years or more under their plan to begin investing heavily in transportation. Lamont estimates toll receipts won’t be available before 2023 or 2024. In a plan called “Prioritize Progress,” Republicans would redirect other bonding — currently used for school construction, capital programs at state universities and economic development — for transportation. State bonding for transportation construction work would swell from about $800 million per year to $1.4 billion annually. If matching federal funding remains flat, Connecticut would be pumping about $2.1 billion per year into its capital program right away. In contrast, Lamont would essentially keep resources for transportation work constant over the next four or five years until toll receipts arrive. Sen. Henri Martin of Bristol and Rep. Laura Devlin of Fairfield, the ranking Republicans on the Transportation Committee — and also members of the Transportation Bonding Subcommittee — said they fear the transportation advocates, the business community, and the general public, don’t understand the Prioritize Progress plan. “We’re trying to take people through this,” Devlin said, noting Republican lawmakers have begun a series of regional informational meetings across the state. “I think if more businesses knew (Connecticut could accelerate repairs now) they would be reaching out to their legislators,” Martin said. But some Democratic legislators have questioned whether Connecticut should freeze borrowing for school and state university building programs — a necessary prerequisite for the GOP alternative to work. Lamont has proposed a “debt diet” that also would restrict borrowing in non-transportation areas, and Prioritize Progress would not be feasible if that “diet” were enforced. In addition, the governor’s budget director, Melissa McCaw, has warned that even were Prioritize Progress followed, the Special Transportation Fund still would need additional resources or be at risk of insolvency by the end of the 2020s.